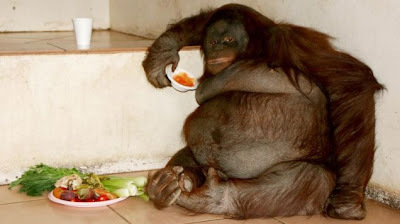 The world's fattest orang-utan is going on a diet! At over 100KG (15 stone), Oshine's diet has consisted of marshmallows, sweets and jelly but now the pudgy primate needs to cut the junk and move to fruit and veg. Oshine spent the last 13 years of her life living as a pet in South Africa but has recently arrived in the UK and will be staying at the Monkey World Ape Rescue Center in southern England. The centre has a total of 230 apes at Monkey World, many of whom have been rescued from captivity. Here's hoping Oshine can cut the calories and lose the pounds. She may even bring out her own fitness video for Christmas!